A dulcimer doesn’t have a neck but it has something under the fingerboard that sort of serves as a neck. Calling it a neck doesn’t really make sense but when the dulcimer has a fingerboard on top of the object that shall not be called a neck then appropriate terminology becomes even more confusing. For no particular reason I refer to the lower portion of the assembly as the fretboard and call the fingerboard overlay the fingerboard. When describing a fretboard with a fingerboard on it I refer to the assembled unit as a fretboard. In the photograph above I’m gluing the fretboard assembly to a dulcimer soundboard. The soundboard is clamped to a flat workboard. Two clamps come in from the sides holding scraps of wood that rest against the sides of the fretboard at either end. This makes it easy to accurately place the fretboard in the right spot and helps prevent it from moving while I apply the clamps. 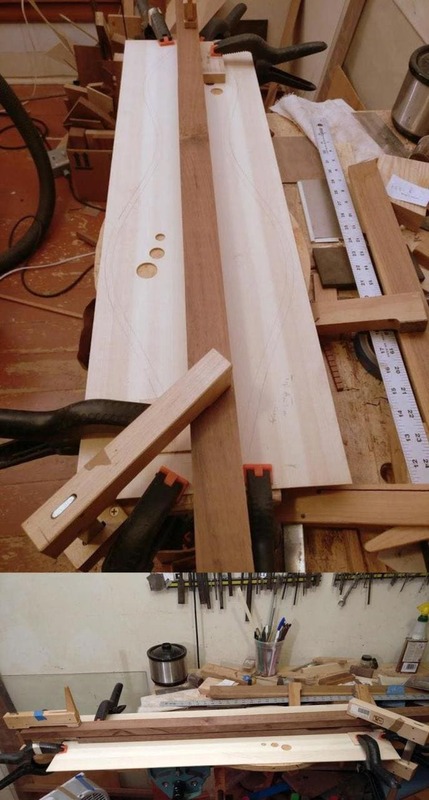 I use an old trick to clamp the full length of the fretboard down using only two clamps. A long, warped piece of wood is used as a clamping caul with the concave side facing down along the length of the fretboard. When I clamp both ends down the flattening of the warped wood exerts pressure along the entire length of the fretboard. You can follow more of my my action-packed adventures as a dulcimer maker by following me on Instagram. Man cannot live without a permanent trust in something indestructible within himself, though both that indestructible something and his own trust in it may remain permanently concealed from him.